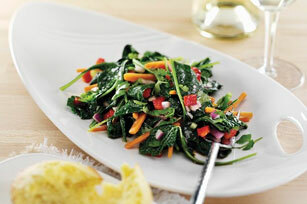 Want more kale on the menu? This salad makes it easy. Add veggies, some fresh cilantro and a sweet-spicy vinaigrette—and expect requests to make it again. Combine all ingredients in large bowl except dressing. Drizzle with dressing just before serving; mix lightly. When chopping parsley or cilantro, chop both the leaves and tender portion at the tops of the stems. Both are tender and full of flavour. Because the base of the stems are tougher, they should be discarded. To cut down on the prep time, purchase ready-to-use cut-up vegetables from the salad bar of your grocery store to use to quickly assemble salads or side dishes.